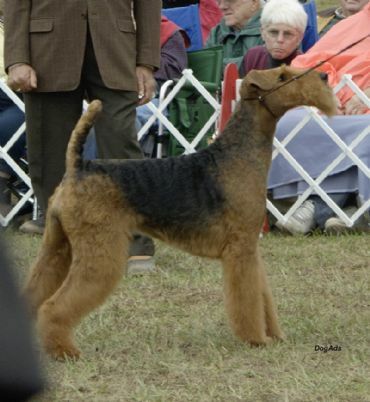 On the famous Montgomery County weekend at Margaret has been best exhibit at the Airedale Terrier Club of America National in 2004 and 2005. She went on to take BIS 3rd at Montgomery County Kennel Club under famous English Terrier Specialist, Ferelith Sommerfield. Before leaving for the USA Margaret was Puppy in Show at the Airedale Club of Victoria in 2003 and Junior in Show at the Sporting Terrier Club of Victoria in 2004. At Melbourne Royal in 2003 Margaret was Runner Up Best of Breed to her Grandsire Grand Ch Old Iron Just Awesome and Best Terrier Puppy. At the Victorian Supreme Terrier Contest Margaret was the inaugural Supreme Terrier Puppy winner in 2004.